This entry was posted in Pre Nuptial, Pre Nuptial Agreements on February 29, 2016. 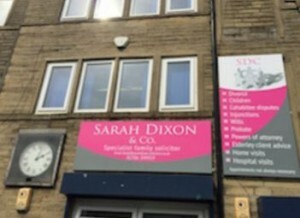 For advice on Pre Nuptial Agreements in Rochdale, speak to the specialists at Sarah Dixon & Co Solicitors; the ‘number one’ family law experts in the area. With a wealth of experience and a ‘can do’ attitude, Sarah Dixon & Co Solicitors have a proven track record for delivering the right legal solutions. Based in Milnrow, Rochdale, Sarah Dixon & Co Solicitors are experts in all aspects of family law; which include pre nuptial agreements. if you have decided with your partner to sign a pre nuptial agreement before entering a marriage or a civil partnership, Sarah Dixon & Co Solicitors offer a caring, professional service that ticks all the right boxes. Pre nuptial agreements in Rochdale are set out on the basis that a couple will divide assets if and when a marriage or civil partnership ends. Particularly appropriate for those who are bringing in significant assets of their own ( if their is a large difference in value between you and your partners assets) you are guaranteed sound, legal advice when you employ the services of Sarah Dixon & Co Solicitors. Call now and arrange an appointment. 01706 399919.